Today, we send millions of Christmas cards every year. But in fact the Christmas card is a relatively modern invention. John Callcott Horsley designed the first commercially-produced Christmas card in 1843. In the Middle Ages, European wood engravers produced prints with religious themes. But the first real Christmas card, as we understand the term today, was designed in London, England in 1840. It went on sale in 1843. The designer was John Callcott Horsley, a well known British painter and member of the Royal Academy. He designed the card at the suggestion of his friend Sir Henry Cole, who was the first director of the Victoria & Albert Museum. Horsley produced 1,000 cards and offered them for sale at 1s (one shilling) each. 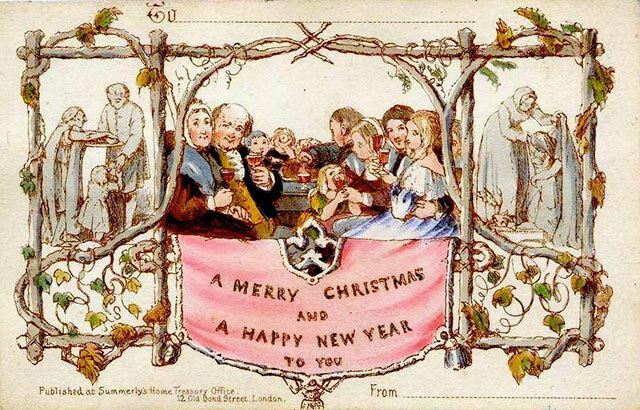 They were printed on stiff card and coloured by hand, with the greeting: "A Merry Christmas and a Happy New Year to You". The card shows three pictures: in the centre, a family party; to one side the hungry receiving food; to the other side the poor being clothed. Puritans immediately denounced the card, since it showed people drinking in the family party. But with most people the idea was a great success and the Christmas card quickly became very popular. Christmas cards were not the first greetings cards. Since 1796, with improvements in printing, merchants had been sending cards to their customers offering "best wishes" for the new year. In many countries, Christmas cards gradually became even more popular than New Year's cards. As Christmas is the birthday of Jesus Christ, cards often show scenes of His nativity. Others show images associated with Christmas such as wintry scenes of snow-laden pines, Father Christmas (Santa Claus), stars, candles or holly. The traditional greeting written on a Christmas card is "Merry Christmas", but many other greetings are also used, such as "Happy Xmas" or "Happy Noel".